The reforms introduced to the EUETS for Phase 4 improve its functioning, but without further reform a chronic surplus looks likely and the risk of low prices remains. The changes to the EUETS that were agreed in late 2017 make significant improvements to its design. The temporary doubling of the intake rate for the MSR will reduce the surplus in the market more quickly. And the provision to cancel allowances from the MSR when it exceeds a defined size will avoid the number of allowances in the MSR growing indefinitely. The price of EUA’s has risen, although they remain below the levels needed to stimulate many efficient emissions reductions. These changes have led some to conclude that the problems with the EUETS have been resolved. However, major risks remain. The cap for Phase 4 (which runs through the 2020s) was set on the basis of an overall reduction in emissions from 1990 levels of 40% by 2030[i]. In practice, emissions now look likely to reach around 50% below 1990 levels by 2030, and possibly to go lower than this if additional policies are put in place. This looks likely to result in emissions remaining well below the cap throughout Phase 4. This is illustrated in Chart 1 below, which shows three scenarios included in a recent report by climate NGO Sandbag[ii] (to which I contributed). The correspond to overall reductions from 1990 levels of 50%-58% by 2030, rather than the 40% reduction on which the cap was set. Many of the additional emissions reductions are from the sectors covered by the EUETS. In particular increased renewables and decreased coal and lignite burn in power generation are the largest contributors to reduced emissions. 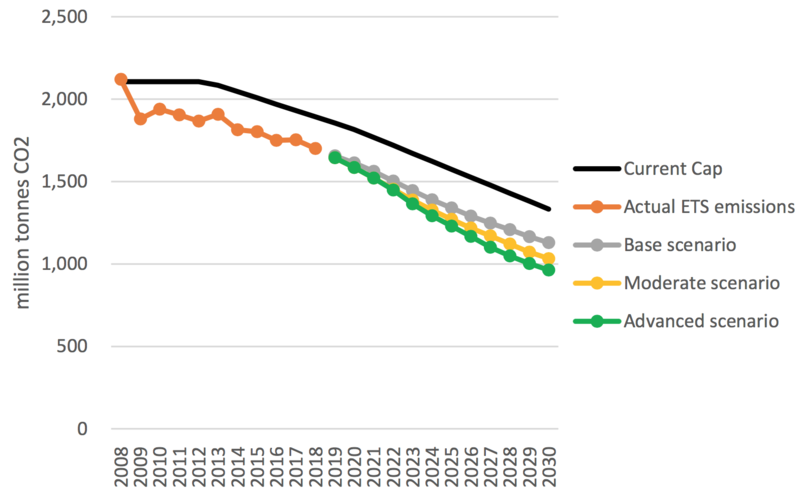 Consequently, in each scenario emissions remain well below the cap throughout the 2020s. Even the European Commission’s own modelling suggests a 46% reduction in emissions from 1990 levels now looks likely. This, while a somewhat smaller decrease than shown in these scenarios, would nevertheless likely result in emissions below the cap throughout the 2020s. 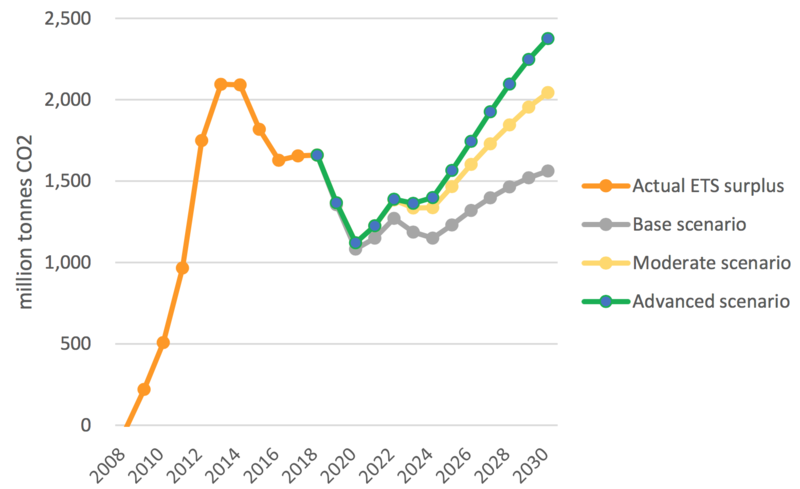 With emissions so persistently below the cap the surplus, after decreasing to 2020, begins to grow again, and continues growing to 2030 (see Chart 2). It does so despite the operation of the MSR. With such a large and persistent surplus there is a clear risk of prices weakening. This is especially the case later in the decade, where reductions in coal use in power generation seem likely to reduce the need for generators to buy emissions as a hedge to cover forward contracts, which may in turn further reduce demand for allowances. The problem of the chronic surplus arises because the cap is both undemanding and rigid. There are at present no mechanisms for automatically resetting it, and no measures such as price containment which might limit how low prices could go. The best way to deal with this problem is simply to reduce the cap in around the middle of Phase 4. This would be in line with the principles of the Paris Agreement, which envisages signatories to the Agreement adjusting their commitments over time to bring them more into line with the agreed temperature targets. 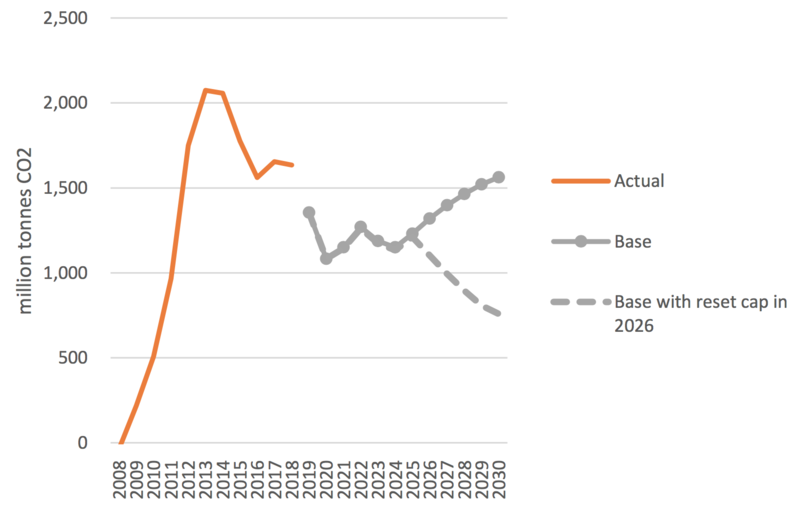 Chart 3 shows the effect of resetting the cap in 2026 to match actual emissions. Under the Base Case the surplus begins to reduce rapidly as a result of the cap being reset. Such an approach could readily be made consistent with other reforms, such as introducing a price floor in the EUETS. While the 2017 reforms to the EUETS were a major step forward they are unlikely to prove sufficient. Further measures will be needed to make sure the EUETS is robust as emissions continue to fall. [i] With a 43% reduction from 2005 levels in the sectors covered by the EUETS. This entry was posted in carbon pricing, climate change, Climate change policy, emissions targets, emissions trading, greenhouse gas emissions, long term targets, Paris Agreement and tagged carbon pricing, climate change, climate change policy, decarbonisation, emissions trading, emissions trading scheme, EUETS, long term emissions targets, Paris Agreement on 09/04/2019 by adamwhitmore.